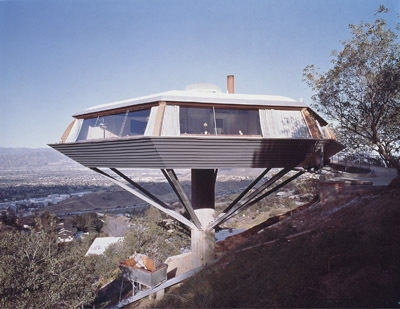 John Lautner, Chemosphere (Malin residence), 1960, Los Angeles. Photo: Julius Schulman/Julius Schulman Photography Archive, J. Paul Getty Trust. Architect John Lautner's hillside houses and roadside restaurants stand as glamorous landmarks in the contradictory dreamscape of postwar Los Angeles. Contrived to deliver expansive views from difficult sites, they are eccentric, high-tech, nature-infatuated refuges from the freeway. This ambitious retrospective features more than one hundred works made between 1940 and 1994 (the year of Lautner's death), including drawings, short films, and a slide show. The most convincing heir of Frank Lloyd Wright's organicism, Lautner constantly struggled to distinguish his late-Romantic visions from the glittering, self-absorbed city that supported him. By presenting Lautner's lesser-known efforts as well as his LA icons, like Googie's Coffee Shop and the Chemosphere, this show offers a chance to assess the depth of his stylish idiosyncrasies. Travels to the Lighthouse, Glasgow, Mar. 19–July 12, 2009; and other venues.